Global Environmental has been appointed to provide the full range of asbestos management services to a range of healthcare establishments – most recently Barts Health NHS Trust where we have delivered a major survey programme, training and project management of the remediation phase. The experience has taught us the value of developing and maintaining good communications with the Estates Team, staff and visitors and planning the sequence of works around the activities taking place in the hospital/practice. 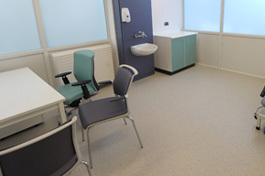 Segregation and sequencing of works (typically involving out-of-hours working) enables the organisations to remain fully live throughout – a major consideration when working in healthcare environments.